As bmaz has pointed out in language blunt enough that one presumes even the willfully obtuse Holder Justice Department might understand it, many of us are bearing witness to investigator John H. Durham intentionally allowing the statute of limitations to expire on Jose Rodriguez’s crime of destroying videotaped evidence of torture. Marcy Wheeler’s torture timeline links to the documentation that the tape destruction occurred on November 8, 2005. The five year statute of limitations on that charge will expire in just a few days. Further, my understanding of the timeline is that the last known waterboardings took place in March, 2003. Some aspects of the torture statutes carry an eight year statute of limitations, so that deadline for waterboarding prosecutions will expire in just a few months. However, with over a hundred deaths of prisoners during US interrogations, there are a number of potential murder charges that are not subject to a statute of limitations. Just for review, here is a piece of the strongest evidence against Jose Rodriguez for him to charged with conspiracy to commit torture. He was head of the Counterterrorism Center (CTC) at the time that Khalid Sheikh Mohammed was waterboarded. 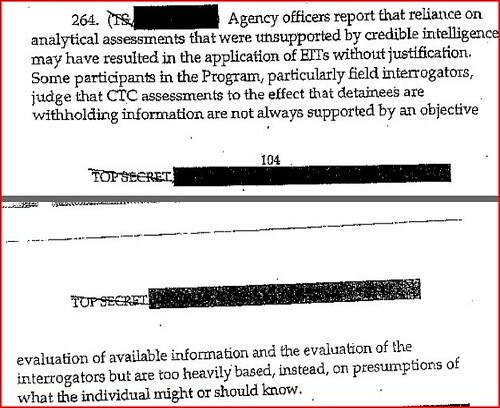 From the CIA OIG report, as I first mentioned in this diary, we have the following passage, where it is clear that Rodriguez’s CTC assessments “were unsupported by credible intelligence” and resulted in the “application of EIT’s without justification”. That means people were tortured without basis in credible intelligence, but were instead tortured, on Rodriguez’s order, based on his belief of “what the individual might or should know”. At that time, March 2003, Bush wanted evidence of Saddam Hussein working with al Qaeda on the 9/11 attacks, so that is the best guess on what CTC thought that KSM “should know” and therefore should have divulged during the 183 waterboardings. It is difficult to imagine why Durham and by extension, Eric Holder and Barack Obama, all believe that they will be able to wrap up this whitewash by saying that nothing can be done once the statutes of limitations have expired. Lurking in the shadows behind the torture and obstruction of justice charges, we still have the ugly truth. . . . [cont’d.] of over a hundred deaths of prisoners during interrogations. There is no statute of limitations on murder, so there is no way to run out the clock on these charges. How will David Margolis be able to downgrade these crimes, to follow onto his degrading the Justice Department’s Office of Professional Responsibility report, where he reduced offenses by John Yoo and Jay Bybee to mere “bad judgment” from the original professional misconduct charges in their drafting of the torture memos? What Durham, Holder and Obama need to know is that there is a community of people who believe that our country should abide by the rules of civilization and that when torture occurs, those responsible for giving the orders need to be held accountable. They should also know that the international community considers these crimes to be war crimes, and under that framework there are no statutes of limitations and no possibility for pardons or mitigating circumstances. By actively suppressing the investigation of war crimes, are Durham, Holder and Obama making themselves accessories to them? Lurking in the shadows behind the torture and obstruction of justice charges, we still have the ugly truth of over a hundred deaths of prisoners during interrogations. There is no statute of limitations on murder, so there is no way to run out the clock on these charges. How will David Margolis be able to downgrade these crimes, to follow onto his degrading the Justice Department’s Office of Professional Responsibility report, where he reduced offenses by John Yoo and Jay Bybee to mere “bad judgment” from the original professional misconduct charges in their drafting of the torture memos? Nominations Are Open: Who’s to Run Against Obama?